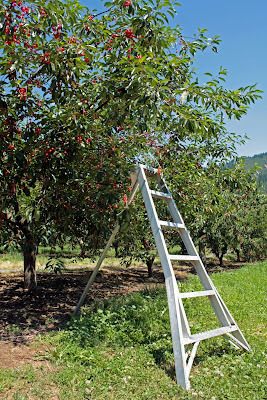 When I told my mother that we had gone cherry picking, she cursed at me. After I told her that we got loads of sour cherries too, she threatened to hang up the phone. In a fit of jealousy, she told me to lose her number and never call her again. 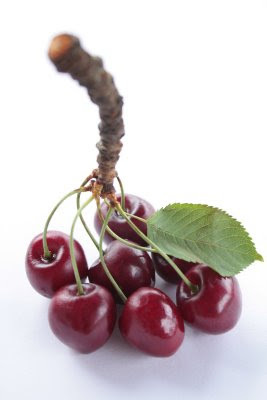 You see, sour cherries are her favorite, but she lives in Texas, where sweet cherries must be shipped in and fresh sour cherries are completely unknown. But the husband and I live a mere two-hour drive from cherry country. So every summer, we make a point of heading out to the cherry orchards at least once. We pick as many cherries as we can cram into the refrigerator and then some. Sour pie cherries are always the hardest to find. 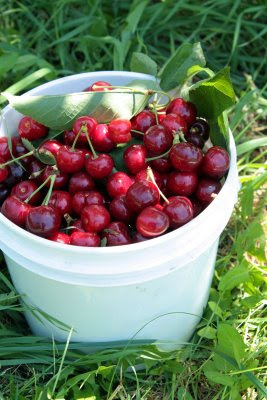 I know of few orchards that still have sour cherry trees, and they’re usually picked clean by the time we make it out. Luckily, this year we hit the jackpot with several pounds of Montmorency cherries. I know it’s weird, but I like to eat sour cherries out of hand, maybe even more than sweet cherries. I love their complex flavor and how they make you pucker up—it’s like being tickled, only in your mouth. I had to muster lots of will power not to eat them all at once, so that I could have enough left to make Sour Cherry Galettes. Schmerber Farms is my new favorite orchard for u-pick cherries, in case you ever happen to be visiting these parts in the summertime. They have eight varieties of sweet cherries, plenty of sour cherries, beautiful scenery, and a very warm welcome. Toss together the cherries, remaining ¾ cup of sugar, cornstarch, and almond extract in a large bowl. Divide the cherry mixture among the dough circles, mounding it in the center of each one. 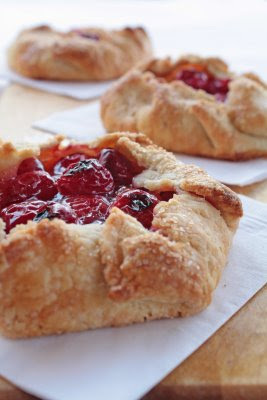 Fold the edge of the dough over the cherries, pleating it as you go. Refrigerate for another 10 minutes. Lightly brush the galette crusts with the cream and sprinkle the galettes with the Turbinado sugar. Bake for 30 to 35 minutes, or until golden brown. Makes 8 individual galettes. Work quickly and with a light touch to prevent the butter in the pastry from melting. Serve at room temperature, perhaps with a scoop of vanilla ice cream. Lose her number?! Never call again?! Your mom seems like a comedian. My mom has the same humor. She's even said that to me when I was on a trip to DC by myself for a week last September. 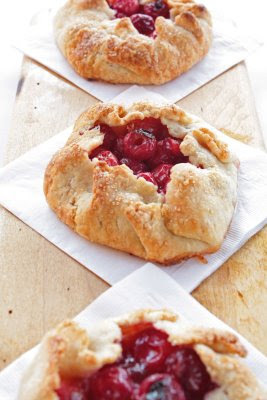 Anyway, these sour cherry galettes are awesome! And those are picture perfect photos! You're making me super hungry now. And I am about to have dinner. I love the recipe and the addition of the Turbinado sugar. Love it! Lucy, these cherries are beautiful. I love it that you have a picture of the twig with it. The galettes look gorgeously delicious! Beautiful pictures and beautiful recipe. Congrats on your book being published, how exciting! PS -my husband's family are xth generation fruit farmers, including cherries. I now know what you're talking about with from the store shipped cherries, and bona fide cherries fresh from the tree. 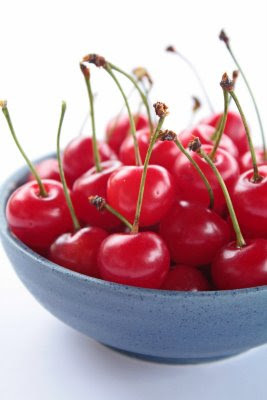 My favorite are Rainiers, the yellow-y white cherry. Those are some beautiful looking galettes! Oh how I wish for some fresh cherries. I just bought some bing cherries at the store and they were mushy, just icky. I love the idea of being tickled in your mouth! It's so perfect and so exactly describes what happens when you eat them. My boyfriend also eats sour cherries right out of hand. Your Galettes are gorgeous! my bags are packed, I am coming for dinner!! Sounds too wonderful! I LOVE sour cherries. Your galettes look amazing! Congrats on your book being published. This look almost sinful! Beautiful photographs! Taking a bit would be my downfall...I wouldn't be able to stop! OMG those are beautiful! I have a neighbor with a sour cherry tree who lets me pick all I want. I've made a couple of recipes so far and have been hunting for more, thanks for this! I am so lucky to have moved into a house 2 years ago with a sour cherry tree. I have gone crazy this year making cherry liqeur, pickled cherries, preserves, and baking up a storm. These Galettes look fantastic and are next on my list. Thank you. I took your Galette and Crostata class. I have since made several of them, and also pie and quiche using your pastry recipe. It turns out beautifully each time, and I get rave reviews. Don't know why other good cooks don't know what you know about piecrust, but I love that I now know how to wow them! 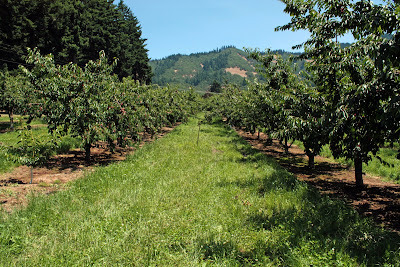 Yesterday I found pie cherries at Rasmussen Farms in Hood River, by luck! Can't wait to get my pie started, and take it to a barbecue this evening. I look forward to taking other of your classes. You are an awesome inspiration to me.